I did this piece after watching Mel Gibson's "The Passion". The imagery of the movie was so powerful, I just had to try and capture that feeling. 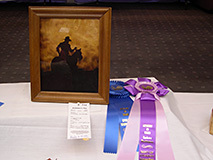 I entered it in several carving shows and received several awards for it including First Place, Best of Division, and Second Best of Show. It now resides in Komsomolsk na-Amure, Russia. I've always enjoyed sunset pictures. I like the play of light and dark, and I wondered if it was possible to capture that same feeling with pyrography. Different woods will "burn" a slightly different color, so by finding the right wood and picking a finish that enhances the color I found it is very possible to create the mysterious feeling of sunset. 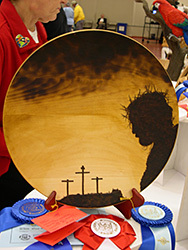 I have entered this piece in carving shows and have received several First Place and Best of Division awards.